Friction PTFE coating that gives between 20 to 50% improvement (material dependent) when sawing and offers improved life. Double ground, patented tooth grind. ProTouch grip with three times more elastomer for maximum soft feel. Increased hand space for use with gloves. 90° and 45° markings. 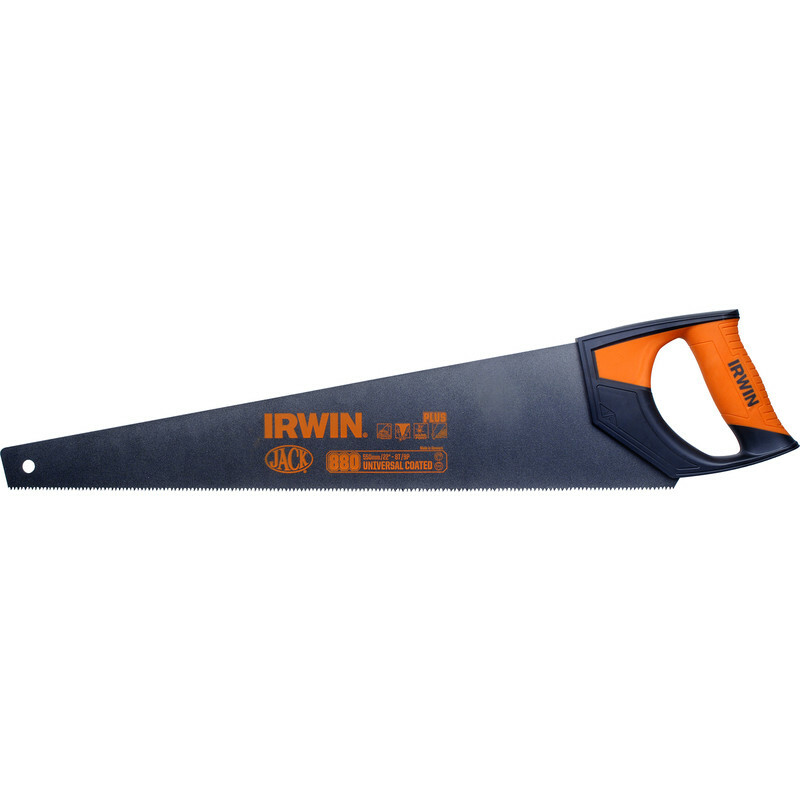 Irwin 880 Plus Universal Coated Saw 550mm (22") is rated 5.0 out of 5 by 5. Rated 5 out of 5 by Pet er from Like a hot knife through butter. Just bought this saw to cut joists and decking. It is definitely the best saw I have ever owned. It sticks less than others I have used, if the coating lasts it will make cutting much less tiring. I have cut wet wood and dry with relative ease. I like the larger handle which makes it easier wearing gloves. It is quite a fine cut compared with other saws but this does not reduce the rate of cut which is great. Rated 5 out of 5 by Morry63 from The best saw on the market I bought one of these saws about four months ago and it is still in perfect condition. And so I recently got another on for a good friend of mine. Rated 5 out of 5 by Clivis from Very good Bought to cut through sleepers did it with ease ! Rated 5 out of 5 by Doctor Dave from Superb Saw This was an excellent purchase, and enabled me to complete a project that finished the modifications to our kitchen. A good company to deal with. Rated 5 out of 5 by Justone70 from Great Best handsaw I have ever used and I have used plenty! !